Most home and office computer networks today run at 1Gbps. For most users, 1Gbps (equivalent to 125MB/s) is more than enough for their daily usage for office work, video streaming and decent file transfer speeds. However, this can be a huge strain to businesses who depends on the transfer of large files across the network. For example, video production studios will need to transfer their high-resolution raw footage off from their workstation to an archival computer for storage. Moreover, since the size of these files will be relatively large, it will take quite some time to get the transfer done. For such businesses, moving up to a 10Gbps network should be their priority, as they could potentially increase their productivity by tenfold. For example, instead of taking 160 seconds to transfer a 20GB file, they can simply complete the same job in 16 seconds. While these may not seem significant, the differences will be apparent once even larger files are considered. A 16-hour file transfer job on a Gigabit network will be completed in less than 2 hours on a 10Gbps! These are use cases that may not be obvious to the average joe, but could be a challenge to businesses which deal with a huge amount of data on a daily basis. Now we’ve understood the advantages of 10Gbps networks, let’s put such a network to test. Today, we’ve got two 10Gbps products from QNAP to allow us to complete our 10Gbps network. 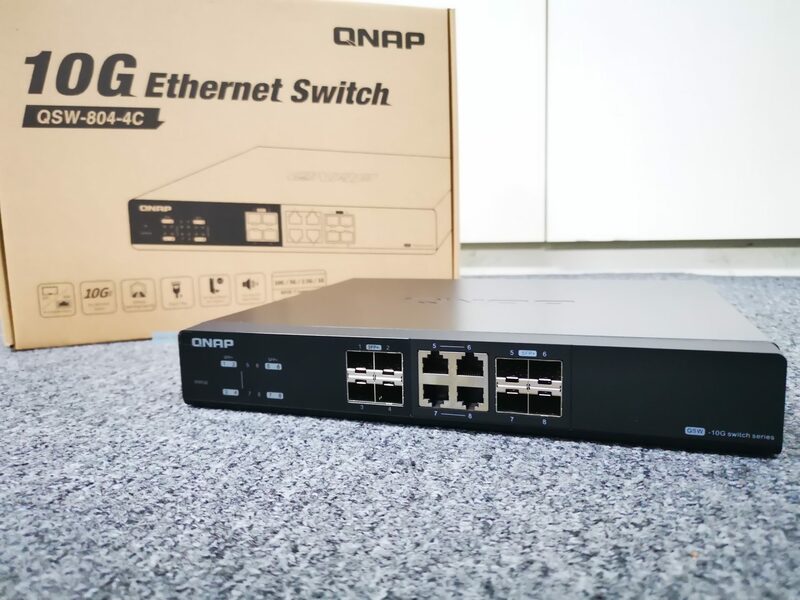 They are the QNAP QSW-804-4C 10G Ethernet Switch and the QXG-10G1T 10GbE Network Adapter. A 10GbE network switch is at the heart of every 10Gbps computer network. The network switch from QNAP enables the switching of network packets at 10Gbps rate. Since the 10GbE switch protocol supports full duplex data transmission, each port can technically handle a total of 20Gbps upstream and downstream data at the same time. It must be taken note that the QNAP QSW-804-4C network switch is in fact a 8-port network switch, instead of a 12-port switch. If you realized, the RJ45 ports and SFP+ ports on the right side of the switch are numbered the same. This is because, these ports are combo ports, and cannot operate together. If you have plugged a RJ45 connector into port 5, SFP+ port number 5 will not work, and vice versa for ports 5 to 8. The QNAP QSW-804-4C is an unmanaged switch, allowing for a simple setup process with no additional configurations required. Simply plug the cables into the switch, and it will do its job. Small businesses can easily upgrade from their Gigabit network to 10Gigabit by simply purchasing unmanaged switches like this. The QNAP QXG-10G1T is actually a simple 10GbE Network card. It connects to a PC via PCI-Express x4 interface, and will work with computers running on Windows, Linux and the QTS operating system. This network card can also be used to upgrade some of QNAP’s NAS devices to 10Gbps connectivity. In fact, the QNAP QXG-10G1T actually runs on the AQC107 10GbE controller from Aquantia. Therefore, you will have to visit the Aquantia main website to download the drivers, instead of QNAP’s official site. The AQC107 is also known to perform well and will be a good start for those who are coming on to the 10Gbps network game. In fact, many motherboard manufacturers also provide the same controller on their motherboard to support 10Gbps connectivity. The QNAP QXG-10G1T makes use of a 10GBase-T standard via a RJ45 port to transmit network packets at 10Gbps. At the port, there are also two LED indicators to show the speed and link activity of the network packets coming in and out of the card. We will be testing network bandwidth and latency between two 10 Gigabit enabled Windows PC. We were also interested to find out the differences in network performance when both computers are connected via the QNAP QSW-804-4C switch and directly between the network cards. The systems are connected via Cat6A cables to the switches/directly. As we can see, the maximum performance we manage to achieve on the systems was 8.54Gbps. This is considered to be quite decent. We also saw that while the packets were switched through the QNAP switch, the performance will drop by about 600Mbps. If you realized that performance seems to be better on System 2, we guessed that the higher CPU frequency on this system made a difference. With a higher CPU clock, it was able to better manage and keep track of the large number of packets. Do note that these measures are in the milliseconds. The network latency of systems are measured in a fraction of a millisecond. As expected, the delay between the communication of the two systems are very low, but as expected, it increases when the switch is placed in between. The QNAP QSW-804-4C 10G Ethernet Switch and the QXG-10G1T 10GbE Network Adapter makes it easy for small business owners to jump on to the 10Gbps network bandwagon. The advantages of 10Gbps networks are obvious and performance surpasses Gigabit ethernet, even though our tests showed that the network systems fall short of theoretical 10Gbps speeds. We also realized that system performance can result in varying network performance on the 10Gigabit standards. Therefore, investment in 10Gbps is much more than network equipment, but also computer systems and infrastructure (CAT6 cabling and above). Business owners must think twice and determine if 10Gbps network is sustainable and worth it. Regardless, with 5G technologies coming up, we know that it’s only a matter of time where 10Gbps networks will become mainstream in the non-enterprise scene. So upgrading and be future-proof with 10Gbps networks could be a wise move after all.